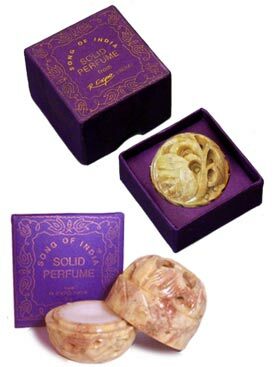 Lotus solid perfume by Song Of India is a temple-quality fragrance that is made in India and packaged in beautiful hand-carved soapstone jars. Song of India’s solid perfumes are made from naturals, flowers, oils, herbs and bee wax. Each carved jar is approximately 1.75" x 1.5" and since they are hand carved no two are exactly alike. Song of India Natural Solid Perfume come in a hand carved stone jar. The approx weight is 5 grams. Just Rub on Body and discover the delightful, long lasting fragrance of Song Of India’s Solid Perfume.